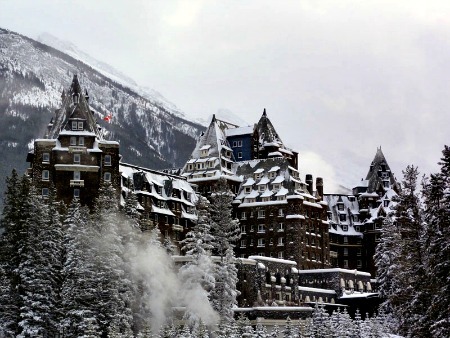 Is the Banff Springs Hotel Haunted? Banff springs hotel was built in the 19th century as one of Canada's grand railway hotels, which were a series of hotels either built by or influenced by Canada's railway companies. Designed in the Scottish Baronial style and set within the rocky mountains, this hotel quickly gained a reputation for being one of the finest hotels in the country since it opened its doors on June 1st, 1888. Starting in the year 1911 a huge project started to replace the original 1888 building with a design by American architect Walter S Painter, the project was done in stages and replaced parts with more modern features, such as the price's shingle style influenced wooded structure with a new concrete building faced with stone. The hotel was originally only open during the warmer months but in the year 1968 it was winterized and has been open all year round ever since. The Banff springs hotel has become quite famous for its ghostly goings on and has been the site of many a paranormal investigation. There are thought to be many ghosts at the hotel, with the exact number being unknown as different ghost hunting groups seem to come up with different answers, but it is thought to be around five. The hotel has two ghosts which are quite well known, and they are that of a tragic bride and a bellman. The bellman is known to be the spirit of Sam McAuley who was a longtime employee at the hotel and was known to have loved working there. He retired a number of times but always came back to work at the place he was so fond of, until he retired for the last time and died shortly after in the year of 1975. When he was alive he always threatened to come back and haunt the place and it seems that's exactly what he did. There are many reports of guests at the hotel claiming to have seen an elderly man dressed in a decades old bellman uniform, with one couple claiming that he helped them get into their room which they had locked themselves out of, only to disappear whilst walking away after helping them. He is also thought to be responsible for making the elevator doors open and close at random times which is thought to be his way of silently saying hello to the guests. Visitors have also claimed to have seen him walk clean through walls or objects within a room. The other well known ghost at the hotel is that of the tragic bride who died at the hotel on her wedding day. The year was 1932 and it was a standard wedding at the hotel, but after the ceremony the bride was walking down one of the staircases when she tripped and fell, dying from the resulting tumble down the steps. One year after her death the stories of her haunting the hotel started, with the first instance being some staff who claimed to have seen her dancing alone in the Rob Roy dining room accompanied by mysterious music with no possible source. She is most often seen around the hour of midnight and always wearing her wedding dress, appearing as a ghostly mist like figure and always appearing to be very sad. Other paranormal activity at the hotel includes everything from orbs to guests reporting seeing tables slide across the room right in-front of them. The hotel management claims that the hotel is most definitely not haunted in anyway but the number of claims of activity and the things people have captured in photos and on film would suggest otherwise.